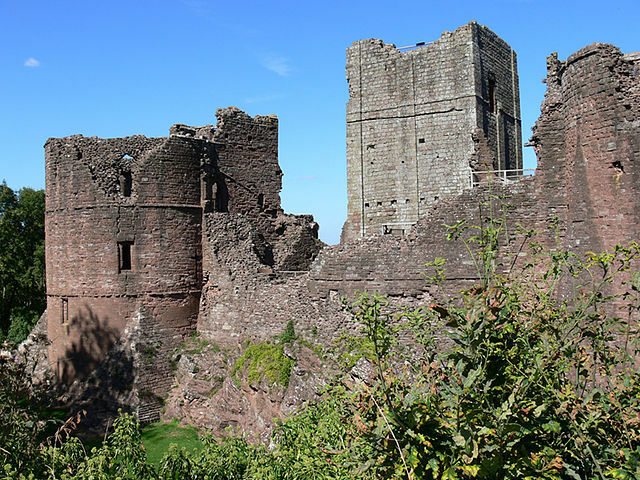 Notes: Goodrich Castle is a now ruinous Norman medieval castle situated to the north of the village of Goodrich in Herefordshire, England, controlling a key location between Monmouth and Ross-on-Wye. It was praised by William Wordsworth as the "noblest ruin in Herefordshire" and is considered by historian Adrian Pettifer to be the "most splendid in the county, and one of the best examples of English military architecture". Goodrich Castle was probably built by Godric of Mappestone after the Norman invasion of England, initially as an earth and wooden fortification. In the middle of the 12th century the original castle was replaced with a stone keep, and was then expanded significantly during the late 13th century into a concentric structure combining luxurious living quarters with extensive defences. The success of Goodrich's design influenced many other constructions across England over the following years. It became the seat of the powerful Talbot family before falling out of favour as a residence in late Tudor times. Held first by Parliamentary and then Royalist forces in the English Civil War of the 1640s, Goodrich was finally successfully besieged by Colonel John Birch in 1646 with the help of the huge "Roaring Meg" mortar, resulting in the subsequent slighting of the castle and its descent into ruin. At the end of the 18th century, however, Goodrich became a noted picturesque ruin and the subject of many paintings and poems; events at the castle provided the inspiration for Wordsworth's famous 1798 poem "We are Seven". By the 20th century the site was a well-known tourist location, now owned by English Heritage and open to the public.